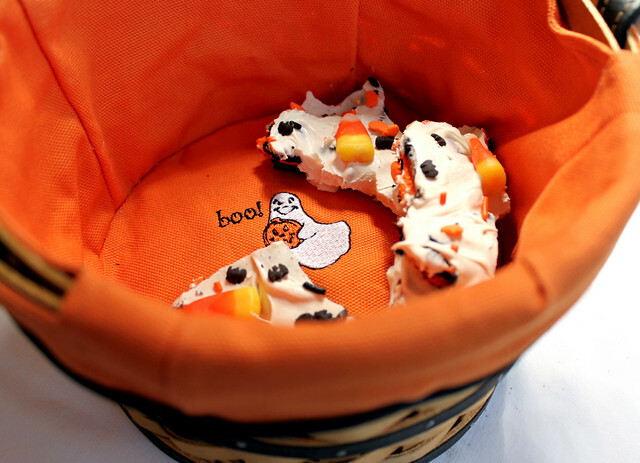 What is Halloween without candy and sweet treats? 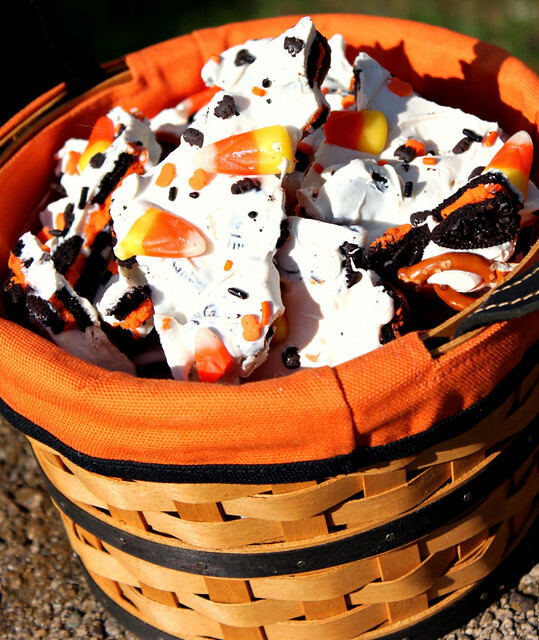 This cute Halloween Candy Bark is full of candy corn, cookies, sprinkles and white chocolate goodness. The addition of salty pretzels helps balance out the sweetness. It is a fun treat to make since you can be really creative with the decoration. I used a combination of candy corn, black sugar, and Halloween themed sprinkles. 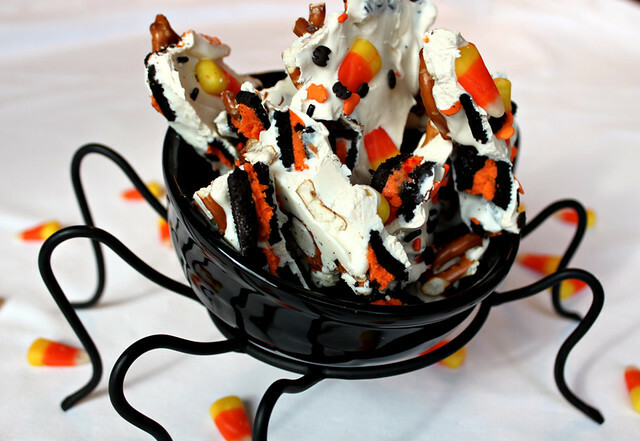 The Perfect Pairing for this bark is Halloween Oreos. You could definitely make this with regular Oreos but I love the bright orange frosting! 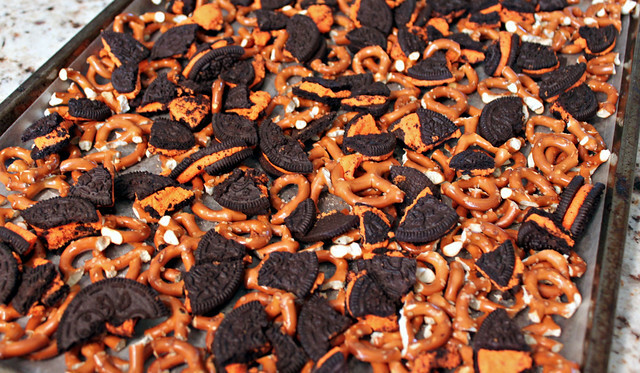 Start off by crushing up your pretzels and Oreos and spread them onto a baking sheet lined with waxed paper. I recommend breaking them up on a separate tray to reduce the amount of crumbs. Pour the white chocolate/almond bark over the pieces and spread it out carefully. Top it off with your favorite decorations and allow to cool until it has completely hardened. Serve it up in your favorite Halloween serving piece! It will be gone before you know it! Line a cookie sheet with waxed paper. Evenly distribute the pretzels and oreos across the cookie sheet. Melt the almond bark according to package instructions. Once completely melted, spread carefully across the cookies and pretzels. Immediately decorate the top with candy corn, sprinkles, sugar, etc. Allow to cool completely. Break into pieces for serving. This looks totally awesome! And your photography is killer! I didn't get a chance to try these for Halloween, but I think I'll give it a try for Christmas...with Christmas Oreos of course!